I Really Need My Teeth Whitener by Tomorrow!! What overnight teeth whitening kits exist that can help me? Whoa there. Just hold up a second. We know you’ve got something important you need to look good for. But, you really don’t want to incur long term problems just to get that extra shade of whiteness in the morning. Do You Want the BEST Overnight Teeth Whitening Kit? If you still think it’s worth it, please read on before you make your choice. 4 What Is Involved with Finding the Right Kit? 5 How Strong Can I Go with Hydrogen Peroxide? 8 But Wait! What If My Teeth Never Get White Enough? 10 Where to Put the Product? Really the only great overnight method is to use some sort of mouth piece to keep the whitening agent in place and on your teeth as you sleep. For an overnight tray to actually be useful, you need to do the best job you can to get your teeth as clean as possible before the treatment. Any and all of these are great things to try to see what works best for you. The bottom line in the preparation phase is to make sure your teeth are as clean as they can be in preparation for teeth whitening. We can’t stress enough that when you teeth start to tell things (sensitivity), you need to listen. Above we mention to brush with an abrasive toothpaste (like one with baking soda). What we mean by that is before using a teeth whitening product, you need to do a quality job of removing any plaque or debris that might prevent the whitening product from actually getting to your teeth . If you have plaque or debris in the way, when it it finally removed, you might end up with spots of discoloration where the teeth whitener couldn’t do its work. This doesn’t mean you should use an abrasive toothpaste, or use abrasive brushing all the time. In fact, one of the main reasons for problems with tooth enamel is brushing too hard, or using abrasive pastes. I’m sure I don’t have to tell you that you don’t want to put yourself into a situation where painful and expensive dental procedures are necessary. What Is Involved with Finding the Right Kit? Over and over again we see in our research that the key to a great whitening product is the amount of hydrogen peroxide the product has. There are exceptions (we’ve included one kit below that doesn’t have hydrogen peroxide, yet still gets quality reviews). But, for the most part, its the amount of hydrogen peroxide in the product that provides the best return on investment. How Strong Can I Go with Hydrogen Peroxide? So, I want to get as white as I can as quickly as I can. Is there such a things a too much Hydrogen Peroxide? Studies have implied that just Hydrogen Peroxide itself doesn’t hurt your enamel (Journal of the American Dental Association (April 2010, Vol. 141:4, pp. 449-454)). However, there are other statistics that imply that at the very least, even if your enamel isn’t being affected, treatments can cause tooth sensitivity for other reasons. Our recommendations for quick results are to only shoot the cannon once. What we mean by that is if you absolutely need results by tomorrow, and you don’t already have tooth sensitivity, a one time treatment using your dentists recommended amount of hydrogen peroxide is the most effective. And, limiting that type of treatment to once is the safest (of course ONLY with your dentists approval). Our better recommendation is that you really should start low and sell high. What we mean by that, is start with low amounts of hydrogen peroxide and move up to higher percentages until you start to feel sensitivity (or get the results you want). Of course, once you get your teeth to a shade of whiteness you want, you should really back off of teeth whitening treatments and move to a maintenance regimen. Once you get your teeth to where you want, you should really move to a maintenance regimen to maintain your level of whiteness. This is a very important step in maintaining white teeth. If you don’t do anything else on this page, make sure you find and implement a regimen that is easy to do and easy to remember. Even if you never get your teeth as white as you want, a great maintenance regimen will at least keep your teeth from getting worse. But Wait! What If My Teeth Never Get White Enough? Don’t tempt fate and put a full court press on your teeth to try and get them as white as that other person whose teeth just POP. Each person has a different level of whiteness that they can get to. So, just because your buddy’s teeth are still whiter than yours, that doesn’t mean you need to compete with them until you get that level of whiteness. Yes, age is that one that defeats us all. Science hasn’t figured that one out yet (although, I think they are trying really hard). Thin enamel and yellow dentin can be genetics working against you. Although, there are remineralizing toothpastes that can help. During our research, we found a few neat tricks and/or hints to help with using your the best Overnight Teeth Whitening Kits. Like I mentioned above, the best overnight treatments include a mouth tray. If you don’t have one from a previous dentist visit, there is one fairly easy way to get a good tray. If you head over to your local sporting goods store and go to the football section, you can find a football mouthpiece for cheap. They usually include instructions that have you boil the mouthpiece until it becomes soft. Then, after letting it cool to the touch (make sure it’s cool enough to not burn you), you put the mouthpiece into your mouth and bite down to have the soft plastic form around your teeth. If you are choosing a high percentage hydrogen peroxide product, there are many reports about products like these “burning” your gums. 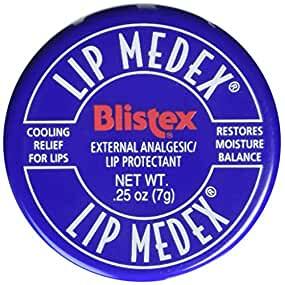 One neat trick we found while researching was to put the Blistex Lip Medex Gel onto your gums right before treatment. Don’t forget to do this both on your top and bottom gums. Using this trick and the next one together seem to produce the best results. Several users reported back in reviews that this really helped to protect you gums from the harsh chemicals in these high hydrogen peroxide products. Where to Put the Product? The next trick we found was to make sure you put the product on the bottom of the teeth. The idea is to let the tray push the product on your teeth upwards towards your gums. When you put your fitted tray on, it will do the rest to get the product up to the rest of your tooth. If you try to put it right up to touching your gums, this is where many people end up with painful gums for a couple of days. Most people reported back three days (and were not happy with how long the pain lasted). We found two great Overnight Teeth Whitening Kits during our research. One of them uses carbomide peroxide (a form of hydrogen peroxide). The other product is hydrogen peroxide free. It is one of the few products we’ve seen that gets good reviews, yet doesn’t include some form of hydrogen peroxide. This was one of the few products where people actually stated that they use it overnight. Even on this product there were others that were “screaming NO!” to overnight use. The risk of gum burn is the primary reason folks were objecting to overnight teeth whitening kits. Even so, there were others that claim that overnight use is how they use the product. This product uses 22% carbamide peroxide as the primary active ingredient. The product link above has the expectation of lasting 3 weeks if used in proper amounts each day. A mouth tray is recommended and not included. 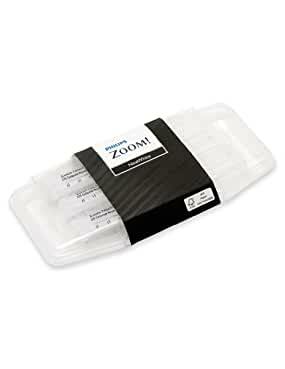 Here is a link to a popular mouth tray made by Pristine Teeth Whitening. 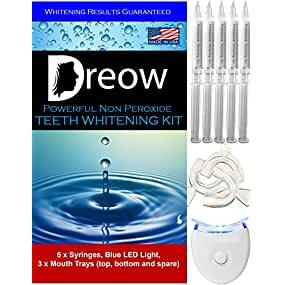 Dreow produces this teeth whitening product that doesn’t include hydrogen peroxide, or some other derivative of hydrogen peroxide. Reviews for this product indeed give this product some credibility. All 30+ of the reviews are either 4 or 5 stars on Amazon. This might not seem like a lot of reviews, but reading through the reviews, this Non-Peroxide Teeth Whitening Kit really does the job well. The only drawback to several of the reviews was that even though the reviewer was a verified purchaser of this product, they mention that the product was given to them for review. The reviewers claim they were not swayed by the fact that the product was given to them free for providing the review. Our conclusions are that you can find really great overnight teeth whitening kits. However, you should be very careful on how you use them, or you might end up in a lot of pain. Or, worse, you might find yourself in a dentist office trying to get professional solutions to the problems the kits created. So, follow some of the recommendations we’ve provided above, and you should be fine using one of the two great overnight teeth whitening kits we recommended. Yes there are minor side effects of teet whitening. Thank you for your interest in Overnight Teeth Whitening Kits. I agree with you that there can be minor side effects associated with teeth whitening. The higher the concentration of teeth whitening ingredients (typically hydrogen peroxide), the higher the risks. Searching for dental implants in wimpole street? I’m not familiar with wimpole street. I had such a pleasant knowledge at Parker Dentistry! Thank you for your interest in Dazzling White Teeth HQ, I’m glad Parker Dentistry was helpful.